Islamic State militants have attacked Afghan soldiers guarding a military academy in the capital of Kabul today, killing at least 11 troops and wounding 16. The attack was the latest in a wave of relentless violence in Kabul this month unleashed by the Taliban and the rival Islamic State group that has killed scores and left hundreds wounded. Monday’s attack started around 4 a.m., witnesses said, and fighting continued long after daybreak. 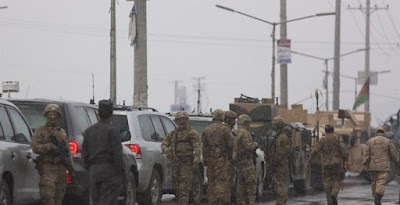 A suicide bomber first struck the military unit responsible for providing security for the academy, followed by a gunbattle with the troops, said Dawlat Waziri, spokesman for the Afghan defense ministry. At least five insurgents were involved in the early morning assault, according to Waziri. Two of the attackers were killed in the gunbattle, two detonated their suicide vests and one was arrested by the troops, he said. All roads leading to the military academy have now being blocked by police, which only allowed ambulances access to the site to transfer the wounded to hospitals.